Okamoto's age has helped her garner national and regional media attention as she tries to become the youngest member of the City Council. Nadya Okamoto ’20 is not your typical candidate for City Council. 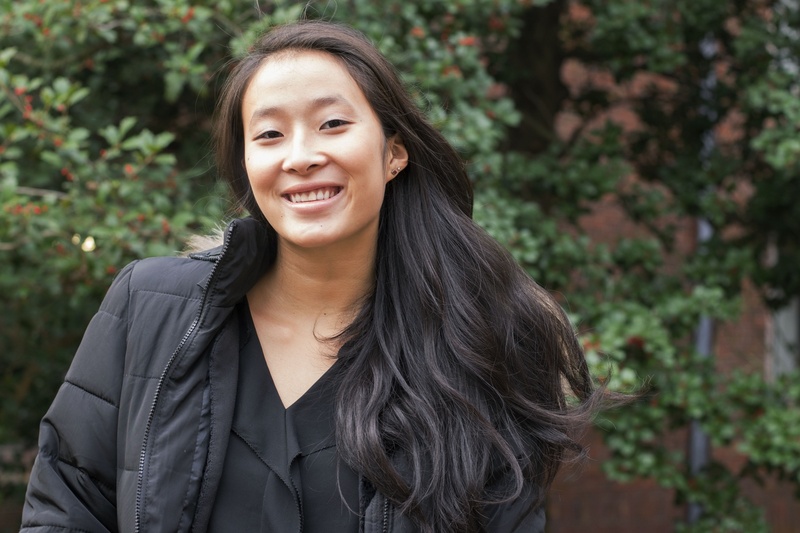 A Harvard College sophomore who moved to Cambridge from Portland, Ore. her freshmen year of high school, Okamoto built a women’s health non-profit called PERIOD. that provides feminine hygiene products to low-income women . Her age has helped her garner national and regional media attention as she tries to become the youngest member of the City Council. NADYA OKAMOTO: Housing affordability, and a lack of a climate change preparedness plan. City Council’s done a lot of work in identifying what severe risk we’re at. But there’s no movement on green infrastructure, and making sure that we’re ready for that. But first and foremost, it’s economic diversity, and there’s just so many families that are being priced out of Cambridge right now because they can’t afford to live here. My top priority would be to preserving economic diversity. NO: What’s unique to me is that almost every candidate is saying that our top priority is housing affordability and allowing people to live in their homes, who are fighting against housing instability. But I’m actually the only candidate that’s experienced housing instability, and I think the lack of understanding for that experience is causing harm to a lot of policies. NO: Cambridge has an affordable housing trust, but there’s a lot that we can be doing not only to grow that. We could also use the affordable housing trust and actually build housing for the purpose of affordable housing. We could also build mixed income housing for the middle class and beyond that as well. NO: It’s more and more of a question of climate change. It makes me so mad. But now, what we do with climate change is up to the city, not up to the federal government, because the federal government is not acknowledging climate change. In addition to that, with Deferred Action for Childhood Arrivals and being a sanctuary city, there’s these like threats if we were to continue being a sanctuary city. And people are saying that’s not possible anymore, but the idea that could happen, the city has to be prepared for that. And I think we are. NO: I think we could always be doing more. I think Cambridge has done a great job of standing up and being a sanctuary city, but there’s more that we can be doing with all the universities, what we could be doing about Title IX, and protecting all the students there. What we could be doing about climate change. Cambridge is not a leader in climate change. At all. And it can be. The other thing I’m focusing on at the top of my platform is education equity, so access to the technology to equal the playing field. And more sustainable living which means climate change preparedness, but also safer streets for residents and more benches for the senior citizens, and more protected bike lanes where appropriate, that kind of thing. NO: People get very heated about this. There’s just a lack of transparency and involvement of the community in the planning process right now. I really want to somehow implement a digital system or a way for constituents to check in and know exactly what to expect in terms of bike lanes coming up, where to give feedback to it. Because I think what’s happening right now is that constituents feel like they don’t have a say in where the bike lanes are going. So, there are places where there are more bike lanes are needed, and places where there aren’t more bike lanes needed, so constituents think it’s actually more dangerous to add more bike lanes in certain areas. We need to prioritize building bike lanes where constituents actually want them. NO: It should. I think it has a responsibility to. The city can do it, because the city is in charge of zoning. I think the magic of the Harvard Square, this is where the students get really amped up too, because we all love Harvard Square because we can walk to Felipe’s, and because we can walk to that bougie store that only sells Canada Goose jackets. That’s a part of loving Harvard Square, we’re not in this bustling city, we’re in this special locale. NO: I think Cambridge should be careful where these dispensaries are going, and what they’re in close proximity to. There are a lot of schools here, and I think Cambridge needs to be thinking about where these are going, and in proximity to what.